This page has photos and pedigrees of our female Deerhounds at Anduril. The female star of the kennel is Grand Ch Anduril Ravenscraig (Raven) and she is owned and handled by Melanie Buckley of Fyrth Kennels in the ACT. 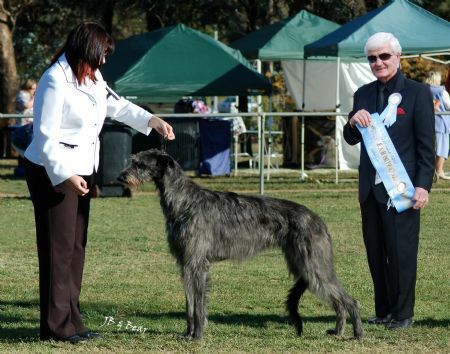 At just one year old Raven achieved her Australian Championship title and has been spectacularly successful in the showring. She is a multiple Best in Specialty Show winner with multiple Best/Runner Up in Group and Class in Show awards guided by Melanie's exceptional professional handling skills. We are grateful to all of the judges, both Australian and overseas who have recognised her quality. Click on the View More Details link below the photos for the pedigree information.